We found so much great information about Christmas from the Medieval era we had to put it all in a 5 page PDF Booklet. For instance, did you know it's actually NOT bad form to call Christmas "Xmas"? In Greek, the letter ? (chi), is the first letter of Christ, and it, or the similar Roman letter X, has been used as an abbreviation for Christ since the� 16th century. Hence, Xmas is sometimes used as an abbreviation for Christmas. 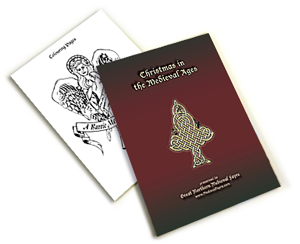 Your new Book about Christmas from the middle ages has all kinds of information, some images illustrated by Linda Laforge and some Colouring Pages at the back. This book was FREE until December 10th, 2011. We hope to sell it for a small fee to help support the Great Northern Medieval Fayre. Have a safe and merry holiday! Teachers who register to come out to our Education Days will receive this and much more as part as an additional educational resource.